The United Nations held a roundtable last week on "sustainable floating cities," an attempt to probe whether building infrastructure on top of floating modules could offer protection from rising sea levels and withstand extreme storms. A concept from Oceanix, whose partners include Danish architect Bjarke Ingels and MIT’s Center for Ocean Engineering, would create small developments in coastal areas that could support housing, workplaces and community buildings. A 4.5-acre bloc of hexagonal modules could house about 300 people, and would be moored near a city and connected through ferries and drones. 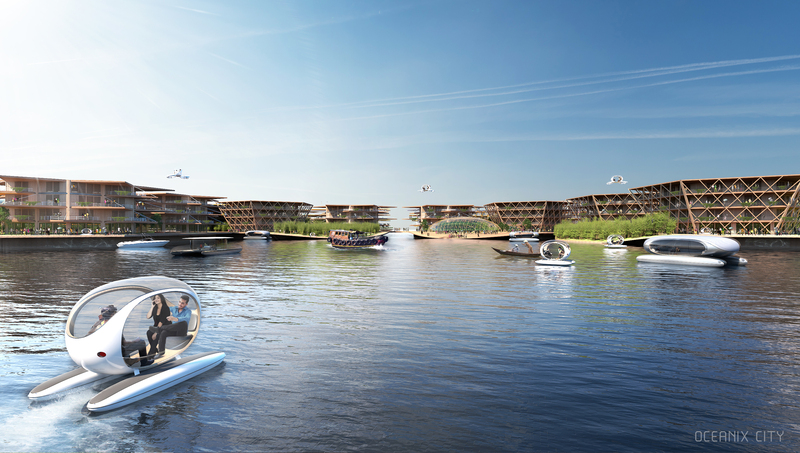 The idea of a floating city may seem like something out of science fiction, but policymakers are increasingly interested in it as a way to ease the strain on cities. Populations are becoming concentrated in cities, with the U.N. projecting that more than two thirds of people will live in urban areas by 2050. That’s taxing housing and transportation infrastructure, while at the same time exposing coastal residents to more threats from rising sea levels and storms (two out of every five people live within 100 kilometers of a coastline, according to the U.N.). Adding infrastructure on the water would help accommodate those booming populations, especially if built to handle waves and storms. They could even be used to house people displaced from coastal areas disappearing because of climate change. Oceanix has emphasized sustainability in their pitch. The modules would be able to support food growth and water recycling and would run on solar energy, with an eye to being completely self-sustaining. They would be moored to the ocean floor using “biorock,” a material scientists are currently using to help coral reef growth. The U.N. has not endorsed the proposal, and there are still countless questions to work out, especially regarding who would live on the islands and where they could be supported. National Geographic reports that one participant suggested the modules could support retirement housing, another said they would be appealing for youth. From another frame, a floating city could be seen as a way to cordon off certain populations. Still, the immense challenges facing cities require far-out solutions, and participants made clear that even floating cities are not off-limits.